Who doesn’t love pizza? I certainly do! With pizza, there’s something for everyone, no matter what your tastes are. For me, I love a good traditional sausage pizza. Maybe some pepperoni on occasion, but it all depends on where it’s from. Some pepperoni is too wimpy, some too greasy, and some shrivels up into nothing but a tiny crunchy grease cup. 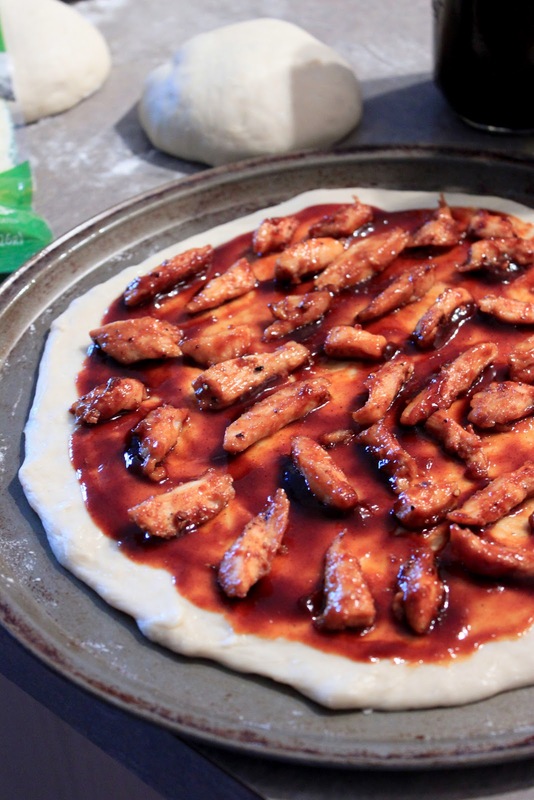 But if I get to pick any pizza I want—anything my little heart desires, I’m always going to pick BBQ Chicken Pizza. Always. It’s my absolute favorite, pretty much no matter where it’s from. But going out for pizza tends to get expensive, and with Boyfriend and I trying to cut back on eating out, I’ve started making my own. And I have to say, while it’s a bit more work than just dialing the local pizza place, it’s every bit as delicious. The dough is super simple—it’s Pioneer Woman’s basic pizza dough. I sweetened it up with a bit of honey because I’m a sucker for anything sweet. Throw the ingredients in the mixer and mix until it’s just combined. No kneading. No fuss. Just mix and let rise for about an hour. Or make it a couple days before and throw it in the fridge until you’re ready to use it. It makes enough dough for 2 extra large pizzas, 3 large pizzas, or 4 medium sized pizzas. Cut the dough down even smaller for personal sized pizzas. I wrapped my leftover dough in plastic wrap, put it in a plastic bag and tossed it into the freezer, so I can make pizza whenever I want! Pizza’s pretty self explanatory—throw whatever you want on top and bake. I made mine with some homemade Honey Chipotle BBQ sauce, some mozzarella cheese, and cooked chicken. Sometimes I toss some bacon crumbles on top too. It’s kind of amazing. Most places throw sliced red onions on it too, but I’m not a fan. After it comes out of the oven, top the pizza with a little (or a lot) of finely chopped cilantro for a pop of color and flavor. I think I’ll be having pizza night about once a week now. PS- I'm thinking about adding a little bit of nutritional info to my posts, like how many calories and how much fat are in each recipe. Is that something you'd like to see? 1. Prepare crust: Sprinkle yeast over warm water and let stand for a few minutes. 3. Coat a large bowl with olive oil or cooking spray. Transfer the dough to the bowl and turn to coat in oil. Cover the bowl with plastic wrap and set aside for 1 to 2 hours, or refrigerator up to several days, until ready to use. 4. About 15 minutes before you’re ready to bake the pizza, cook the chicken. Heat a tablespoon of olive oil in a large skillet over medium high heat. When oil is hot, add chicken, season with salt and pepper, and cook until chicken is opaque and cooked through. In the last minute of cooking, add 1 tablespoon of BBQ sauce to chicken and stir to coat evenly. Remove from heat and set aside. 5. Preheat oven to 450F. Spray a baking sheet or pizza pan with non-stick cooking spray; set aside. 7. Roll out or stretch one piece of pizza dough to desired shape and size on prepared baking pan. Drizzle about a teaspoon of olive oil on top of the crust and brush on with a pastry brush or spread with your fingers. Sprinkle a pinch of salt over the crust. 8. Spread about 3 tablespoons of BBQ sauce over the top of the crust in a thin layer, leaving about a ½-inch around the edge of the crust clear. 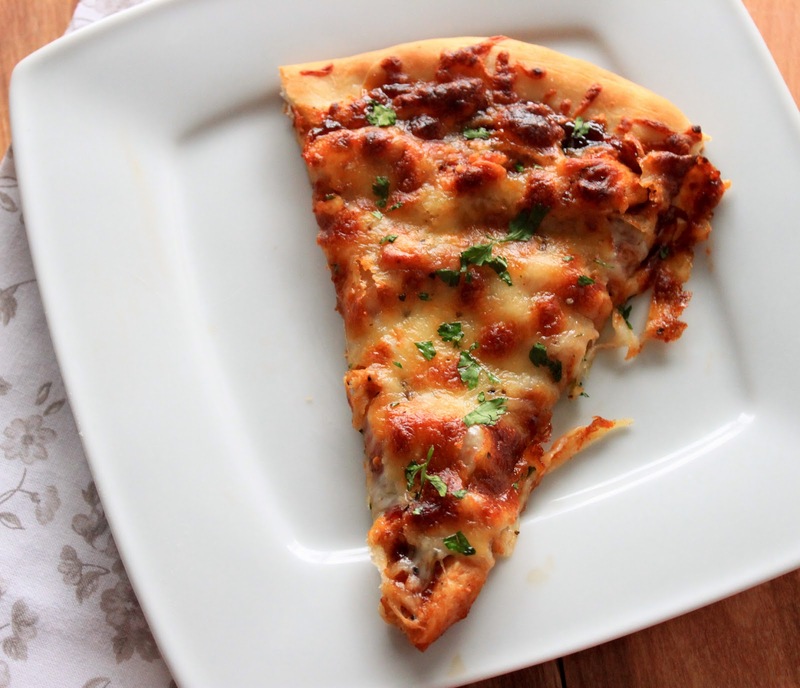 Sprinkle cooked chicken evenly across the crust and top with cheese. If desired, sprinkle red onion and/or bacon crumbles on top of the cheese. 9. 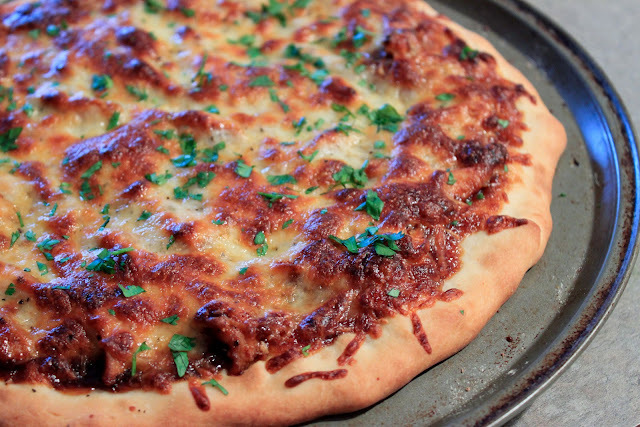 Bake pizza until crust is golden and cheese is bubbly, about 10 to 12 minutes. (I baked mine for 12, and the toppings were a little too browned for my liking.) Remove from oven and sprinkle with chopped cilantro. Let stand for about 2 minutes before slicing and serving.